Sprague Lake at dawn in the eastern portion of Rocky Mountain National Park. This shallow lake sits at an elevation of 8,200 feet and was once a resort owned by Abner Sprague. 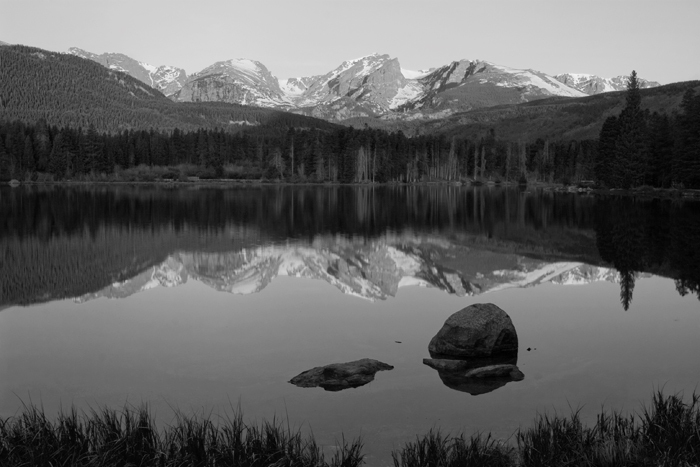 Just before Rocky Mountain National Park was established in 1915, Sprague Lake was enlarged by damming the far end to create better fishing for his lodge guests. The distant mountains in this photograph form part of the Continental Divide. Mountains from left to right are Taylor Peak (13,158), Otis Peak (12,486), Hallett Peak (12,713) , Flattop Mountain (12,324), Notchtop Mountain (12,129). Photo © copyright by Mike Barton.